We’ve never really looked at a device like the CyberData SIP Paging Server before. 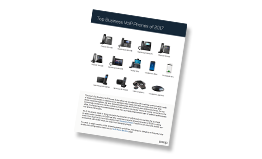 Most of the devices we review are endpoints, designed to function as a phone or phone-like device. The CyberData SIP Paging Server is designed to be an all-in-one system meant to broadcast audio messages over a wide range of devices. The SIP Paging Server registers as a single endpoint and uses multicast IP addresses to page multiple devices on the same network. The newly added bell scheduler feature makes it a great device for schools, warehouses, and other locations that require routine notifications set in advance in addition to real-time paging. In this review, we take a look at the device's features, usability, and interoperability with other SIP devices. The CyberData SIP Paging Server allows you to create up to 100 different paging groups (or paging zones), which when combined with different endpoint configurations (phones, speakers, relays, and the like), give you enormous flexibility. For example, a school could have a paging group for each wing while also having a group designed to reach all wings simultaneously. Below is an example of a complete CyberData solution for a school. This includes speakers, intercoms, a clock, and even an RGB strobe light. The SIP Paging Server is located in the office in this example. If you needed to broadcast a single repeated message, for example, a “now closing” message at the end of the day, you can set paging groups to do just that: Play a pre-selected message. This saves someone from having to manually place that call or page every day. The bell scheduler makes this even easier by allowing you to schedule the call ahead of time. Since we do not have a school to test with, our paging was done through a Polycom VVX410, a Grandstream GXP2140, and a Yealink T48. There were occasional times when we sent a page using the SIP Paging Server and the unit would answer but no sound would play. These incidents were infrequent, and a quick call back to the unit set things right. At times, we also found that the message would be fine going to one phone, but that same broadcast could be staticky or garbled on another phone. Attempts to isolate this issue or make it consistently reproducible failed, and as such we chalked it up to “just one of those things.” We also found that selecting the proper time zone for a scheduled page required consulting the manual, as it isn't a simple drop-down menu. Aside from these infrequent issues, the unit worked quite well for us. The documentation was good at getting us going—you’ll want the Operations Guide, as the Getting Started Guide and Quick-Reference Placemat won’t get you very far past physical installation. The CyberData SIP Paging Server is compatible with Polycom phones. There is a specific Polycom mode that allows you to use Polycom phones in paging groups. Polycom actually implemented their own version of multicast paging after the split with Spectralink, which is odd because it seems like it went from what was the open and accepted standard to their own implementation of multicast paging. Luckily, this is just a port shifting operation. In working with the interoperability team at CyberData, we were able to provision different manufacturers to work with the SIP Paging Server. This means that if your deployment, for example, features a mix of Polycom, Yealink, and Grandstream phones, you can set them up so that all of these phones will receive the pages sent by the SIP Paging Server. It requires a bit of manual configuration on your end, but it is possible. We tested the CyberData SIP Paging Server using Polycom VVX and SPIP phones, Yealink T4X and T5X phones, and Grandstream GXP2130 phones and experienced no issues. Pages, bells, and announcements sounded clean and clear across all three brands. As we are also not a warehouse deployment, we didn’t have some of the equipment to test things like relays, digital to analog conversion, or page port setups. Luckily, we had some audio equipment, so we were able to set up and test the analog out but not the audio in. There is also support for event package notification for tracking through something like Tenfold, which we did not test. First, log in to your account on the OnSIP Admin Portal and either create a new user, or select an existing user you wish to associate with the CyberData SIP Paging Server. 2. Log in to the CyberData SIP Paging Server online. When the CyberData SIP Paging Server is connected to your LAN, enter the IP address of the device into your Internet browser. This will open the CyberData web portal. 3. Enter information from Step 1 under SIP Settings. Enter the information you gathered in Step 1 into the appropriate fields on the SIP Settings page. Make sure to select the fields "Enable SIP operation" and "Register with a SIP server." Before going any further, you will absolutely need to change your admin password on the Admin Settings page. When you export the config file from the SIP Paging Server, the SIP password is exposed, and as such, can be easily stolen and manipulated. To update your clock settings, go to Device. Consult the Operations Guide to ensure that you have selected the correct time zone. Go to Audio files to set your audio files. You will need to read the Operations Guide to get the proper specifications. We recommend Audacity for recording audio messages. 7. Configure a paging group. To configure a paging group, go to Pgroup. You will need to provide an IP address, port, and name. We'd advise consulting the Operations Guide for additional instructions on how to customize your paging group. Click "Save Changes." 8. Configure a scheduled event. To configure a scheduled event, go to Schedules. Here, you can select the days of the week, time, audio file, the number of times you want the message to play, which paging group to assign the event to, and a name. The CyberData SIP Paging Server is a good, inexpensive piece of equipment that does what it means to do quite well. The bell scheduler feature allows users to set up messages in advance, including preselected recordings. It also comes with a Polycom mode that allows it to page Polycom phones, and it can be manually configured to work with other IP phone models as well. We found that we needed to consult the Operations Guide during the setup process, as not everything was intuitive. There were a few small hiccups but nothing we could consistently recreate to try to troubleshoot. As this is a new device with new firmware, it should get better and more reliable over time. Overall, the CyberData SIP Paging Server is a solid device that will work well for schools, warehouses, and other locations where regular announcements and urgent notifications are required.